Posted byMandy	 September 8, 2010 1 Comment on Laura’s Special Sandwich. Long time blog followers will remember my month long sandwich quest. Sometime after that, I popped into The Great Adirondack Soup Company for a Laura’s Special, a sandwich they mentioned to me on facebook. I apologize for the quality of the photo. I took it at work and I just wouldn’t wait to get this sandwich in my face, so I didn’t take a lot of time to take a proper photo. Can you blame my impatience? Look at this sandwich! 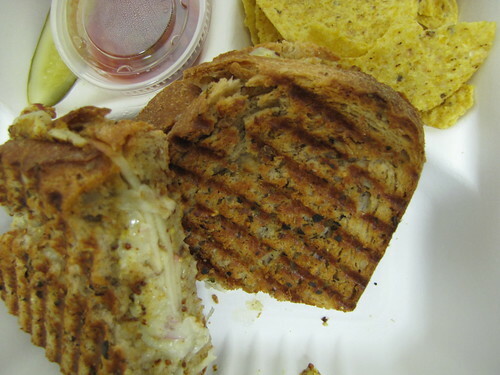 The sandwich is made on multigrain bread, with sliced apple, cheddar cheese, red onion, and apple mustard. Throw the whole darn thing on the panini grill until the cheese is melted. However, since this is not on the menu, you have to ask for it special. I love this! So many of my favorite tastes rolled into one delicious sandwich. I need to go back and have the wonderful folks at The Great Adirondack Soup Company! Have a great day everybody, and keep cooking! This is an epic post about tacos and burritos!